Surfing and yoga have similar requirements for mind and body and combine very well. Surfing and yoga have similar requirements for mind and body and combine very well. We offer daily yoga lessons, which are coordinated with the surf lessons and will help you to progress, have quick successful experiences and recover faster. Our certified and experienced yoga instructors are passionate surfers themselves and have specifically tailored the yoga exercises to your specific requirements. The two 60-minute yoga sessions will be held on 5 days before and after surfing lessons. In the morning it will make you fit for the surf session and in the afternoon it will allow you to recover, relax and sleep well. 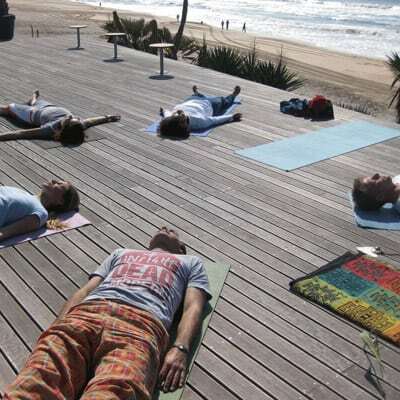 With predominantly good weather the yoga classes will take place in our garden on the wooden deck terrace, at the pool, eventually on the beach or in the mystical forest of the Serra de Sintra. Expect the unexpected! From almost every place you have a fantastic view over the Atlantic and can feel the energy that surrounds this wonderful place. If it should be slightly uncomfortable outside, we arrange ourselves in the protected area of the terrace or in the surf villa close to the cozy fireplace. There is always enough space available, as there is a maximum of 10-12 participants. 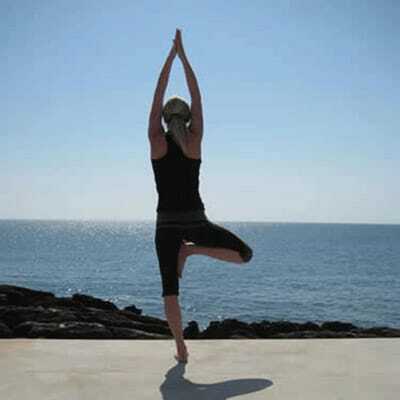 Already after one week of yoga and surfing you will be much more flexible, coordinated, stronger and relaxed. You will emerge from this regular yoga classes noticeably physically and mentally strengthened. This allows you a quicker progress in surfing, guarantees even more fun, helps to regenerate faster and relax more deeply.